For heath and hygiene, it is recommended to disinfect it with hot water for 5 minutes when handing with similar new items for cooking. To use the cooking spray or a tiny bit of olive oil before cracking the egg will be better for get perfect dish. Please kindly buckle the lid hard to fasten it! Easy and convenient to cook soft, medium or hard-boiled eggs. Great for cooking eggs bites, egg white, fruit, cupcakes, frozen treats, candy. Use to prepare recipes for breakfast, lunch, dinner, snack or mealtime spread. Perfect holder for sorting small items. Fun for a birthday or holiday party, baby shower, picnic, wedding or showcase. Silicone Egg Cooker Make cooking eggs easier than ever,Please use caution when handling as contents will be very hot. 【FAST COOKING】: Just crack open the eggs, pour into an egglettes cooking cup,, 8-15 minutes for soft to medium boiled and up to 20 minutes for hard-boiled, heats rapidly to save time, which keeps fresh and nutritious by heating evenly. Make your child fresh with eggs every day. 【EASY TO CLEAN】:Easy to clean-Dishwasher safe and easy to clean! 【FITS FOR ANY POT】: Egg boiler fits perfectly in any pot. No need to worry about the pot size. Detachable & Handy, you can put 1-6PCS egg boiler in pot as your needs. ATTENTION: NOT INTENDED FOR USE IN MICROWAVE OVENS. 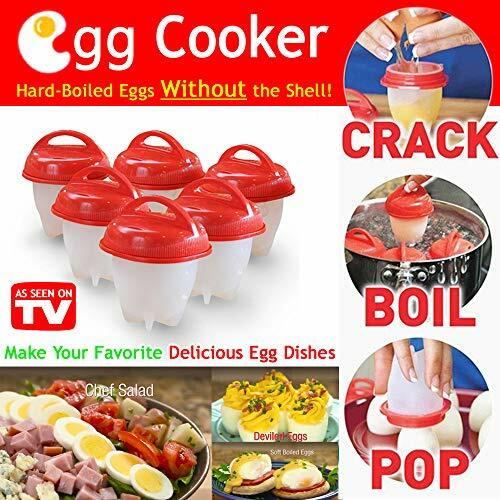 【WIDE RANGE OF APPLICATION】: The egg poachers let you easily make soft, medium, hard boiled eggs, scrambled eggs, mini omelettes, egg salads, eggs benedict, and more. DIY your unique eggs by adding meat or vegetables. If you have any questions about this product by DUT, contact us by completing and submitting the form below. If you are looking for a specif part number, please include it with your message.